Today I will share information about 3 more Chakras. After looking at the Chakras mentioned in the previous Chakra, one must look at he following Chakras. 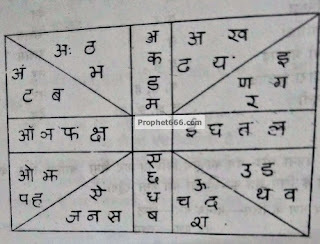 If the God's name's initial letter is 4th,8th or 12th from Sadhak's bracket, the Mantra will give opposite results and will be harmful for the Sadhak. Other than this, all other positions are favourable and good. The counting has to be done clockwise. In this, one must look at the initial letter of his name and then at the initial letter of the Mantra and then look at the results I am giving ahead. Here, the initial letter of the Mantra should not be Mantra itself but of the Mantra Viniyog. If the Viniyog is "ॐ नृसिंह मंत्रस्य...", then 'न' will be the initial letter of the Mantra. Other than this, all the procedure is same as the above Chakra. If the Mantra bracket is 4,8, 12 or 16th from the Sadhak's bracket, then the Mantra is unfavourable and harmful. For all others, they are favourable. This Chakra has been taken from Rudraymala Tantra. 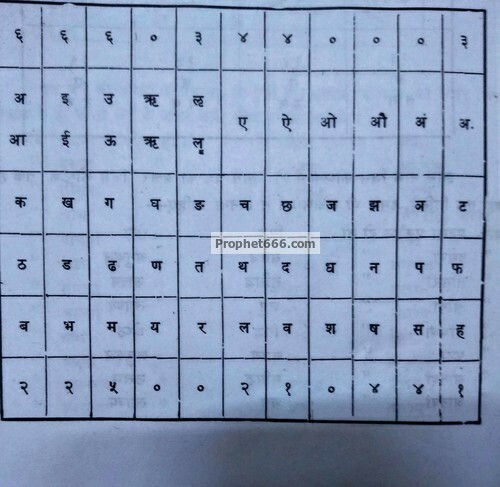 In this, the first line has numbers for the Mantra letters and the bottom line has numbers for the Sadhak's name. The procedure of the Chakra is that one must first separate the letters of the Mantra on a separate piece of paper. One must keep in mind that not the letters but even Varna like "ँ,्,ः ",etc. should be separated. For example the breakup of Narasimha's name "नृसिंह" will be - न, रु, स, इ, ं, ह . 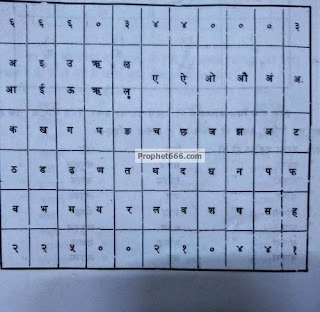 If there any half letter like त् or न् , then the only half of the number must be considered. After breaking up the Mantra and your name as I have mentioned, one must add the numbers belonging to the respective columns. Keep in mind that for Sadhak's name, the number given in the bottom has to be considered. And for the Mantra letters, the numbers given in upper line has to be considered. 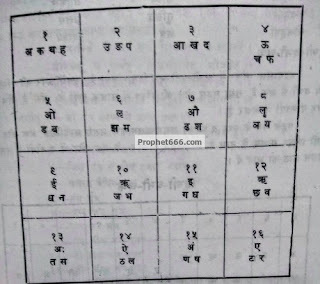 Then, the sum of the Sadhak's name and Mantra's letters, both of them should be divided by 8. A) After dividing, if the number of the Mantra is more than the number of the Sadhak's name, the Mantra is Runi and hence, favourable. B) If number of Mantra and Sadhak's name are equal then the Mantra will be moderately favourable. C) if the Sadhak's number is more than mantra's total then the Mantra is Dhani and such a Mantra will give delayed results. D) if the values of any of them are 0 then the Mantra will bring mostly bring death. This is all for the Chakras. Each and every Chakra needs to be checked by Sadhak. If the Sadhak gets mixed results then he must look at what is in majority. For example, if he is getting unfavourable results in 4 out of 7 results. Then the mantra must be considered as unfavourable. In the next part, I will talk auspicious Tithi, Nakshatra and more such things. Ashok sir and neel sir,Thanks for the hardwork you ppl are doing in educating us with things that only a guru gives to his disciples. Namaste Ashok Sir, Appreciate your efforts for explaining various chakras but I am truly stuck with one query. Your clarifications will help me and other prophet colleagues as well to explore the assessment on chakras. Generally name of the person should be derived based on the Rashi, Nakshatra and pada that particular person was born but unfortunately many people are not named following this rule. Thus could you please suggest the below. How we need to identify the first letter of our name? Thus in the above instance, do we need to consider “Sha” or “Dha”? Your clarification will only be the gateway to explore the chakras explained by you. I have clearly mentioned that one must look at our own name. 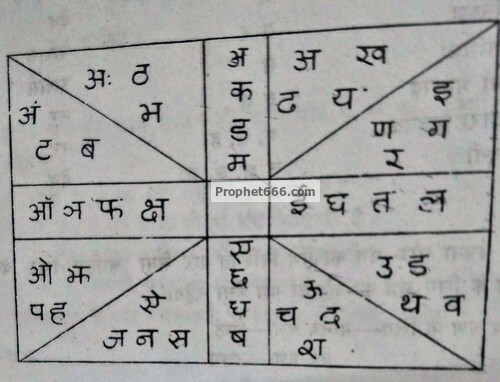 If you look at the nakshatra, rashi,etc then there will be multiple letters. Then how will you utilise these chakras and find favourability? Thanks Ashok Sir for clear clarification. Hi sir , here God refers the kul dev or the god to whom we love to worship have faith and doing sadhana. Invaluable informations have been been provided. I am grateful. 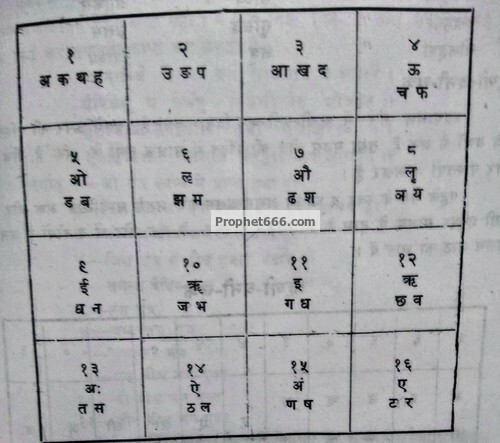 -in all the chakras which you mentioned in this and previous post,we have to start counting from next number/column or from the same number/column,just like you mentioned in the rashi chakra. My name is saurabh my dob is 01-05-1985. I just want to know which god will be suitable for me for doing sadhana among durga,kali,shiv and hanuman.Or should i can sadhana for all mentioned gods please reply it will be very helful for me.